Kat's Stitching: Where Did My Stitchy Bug Go? My stitchy bug has abandoned me! Last week I just could NOT sit down and stitch no matter how hard I tried. I think a lot of it is because I haven't been getting a lot of sleep lately. I was just exhausted all last week. We had a snow day on Friday and I just spent the whole day napping on the couch. Oh well, I'm committed to getting some stitching done this week no matter what. 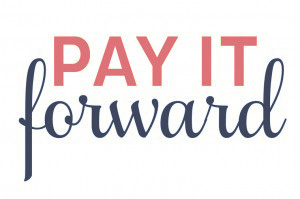 In other news, I'm participating in Pay It Forward. I found it through Jessica at A Humble Creation. The first 5 people to comment on this post will receive a stitchy gift from me sometime this year. The catch is that if you want to participate you have to put this offer up on your blog as well. I just realized that I missed posting my TUSAL this month. I'm at work right now so I will make sure I post some pictures when I get home. I think your stitching bug might be on vacation with mine - cant seem to get back into my HAED project. Would love to be part of your Pay It Forward and will also do this on my blog. Yeah, the stitchy bug has left me as well. I blame the new computer (for grad school this summer). Oh, I understand you.. My stitching bug has gone crazy! I can't make myself sit and take the needle! What a shame! My hubby thinks I'm done with it, but I promise him that he hasn't seen the last of me.